If you are a pasta lover, you likely enjoy the fresh taste of pasta that is made from scratch. 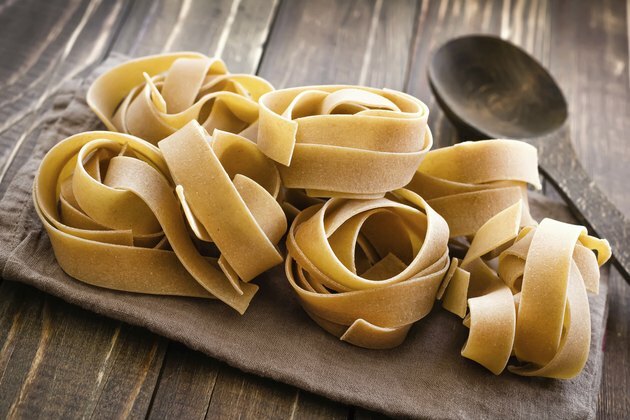 Making your own pasta noodles at home requires just a few simple ingredients, such as flour, eggs and salt, or you can expand the taste by adding other flavors like garlic, spinach or onion. Homemade pasta is also easy to dry and store, which means you can make a large batch at once and eat it throughout the week. Dry the pasta for around 15 minutes before cutting it into shapes to avoid overly sticky dough. Lay the sheet of pasta on a baking sheet that has been dusted with flour, which prevents the dough from sticking to the sheet. Cut the pasta into the desired shapes. Choose any shape that you like, including long strips for spaghetti or round circles for ravioli. Return the smaller shapes, such as the circles, to a dusted baking sheet to continue drying. Turn the shapes over halfway through the drying process to allow both sides to dry evenly. Lay the longer strips of pasta, such as spaghetti, over the back of a chair that is covered with a dishtowel; the towel prevents the pasta from sticking to the chair. This lets the pasta dry in straight long strips rather than curling during the drying process. Spin long pasta noodles, such as fettuccine and angel hair pasta, into round nests, as an alternative to hanging them over the back of a chair. The nests can be easier to store than the long noodles. Turn the nests over several times while they are drying to prevent mold. Dry all of the pasta for an additional 15 minutes, after cutting, for soft pasta, and for at least 1 hour for hard, dried pasta. Place the pasta in airtight containers or zipper-lock plastic bags. The soft pasta should be stored in the refrigerator and eaten within several days. The hard, dried pasta can be stored in a cabinet and will last for several months.